Formaldehyde is a naturally-occurring organic compound with the formula CH2O. It is the simplest aldehyde and is also known by its synonyms name formalin or methanal. The common name of this substance comes from its similarity and relation to formic acid. Formaldehyde is an important precursor to many other materials and chemical compounds. It is mainly used in the production of industrial resins, for the manufacture of particle boards and in the coating industry. Synonyms Formalin; formic aldehyde; formal; methyl aldehyde; methylene glycol; methylene oxide; methanal; morbicid; oxamethane; oxymethylene; paraform; polyoxymethylene glycol; superlysoform. Description Colourless liquid with characteristic pungent odour. * Methanol content may vary as per specific customer’s requirement. Hence sp. gr. will also vary accordingly. ** Valid for SS containers & HDPE carboy packing. Packaging In SS tankers, ISO-containers and in HDPE drums / carboys. Formaldehyde is widely used in the manufacture of amino and phenolic resins, slow release fertilizer and metal homopolymers. It is used in the form of anhydrous monomer, solution polymers and derivatives. Due to relatively low cost, high purity and variety of chemical reactions Formaldehyde has become one of the most important industrial and research chemical. Formaldehyde is also used for manufacture of urea formaldehyde which is used in wood product for plywood, particle boards, etc. It is used as a chemical ground in foundations, used in water based coatings and as moisture resistance in paper. Formaldehyde used with Phenol to make Phenol Formaldehyde resin which is used in wood composite plywood, partial board, fiber board, fiber bonding, laminates, foundry resins, abrasive and friction materials, molding materials, coatings and adhesives. New developments are in the uses of glass reinforced phenolic fibers, phenolic foams and graphite reinforced composite. 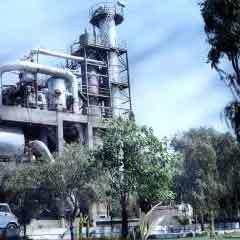 Formaldehyde with Urea forms UF resins which is used as a slow release fertilizer. 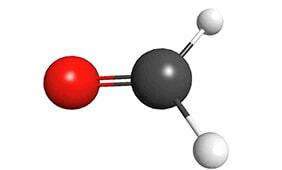 UF containing 35-38% N are products of condensate of Urea and Formaldehyde. Though only 50% of their nitrogen is available for crops, it does provide slow release non-burning nitrogen. Formaldehyde is used with soap as disinfectants. Formaldehyde in hydro-alcoholic solution is used widely to the sterilization of surgical goods. Formaldehyde is used as preservative in cosmetic products so as to have effectiveness against wide range of micro organisims. Formaldehyde is used as preservative in hair shampoo upto 0.04 wt.%. The shampoo composition in general presents ideal environment for propagation of micro organism and fungal attack. This has a deterious effect on physical properties of the shampoo, but more importantly pose a health hazard to the consumer. Formaldehyde is used in the manufacture of chelating agents like EDTA. It is used for the manufacture of permanent press finished of cellulosic fabrics. Formaldehyde with melamine forms melamine formaldehyde resins which finds excellent use in the manufacture of dining table waves like bowls, dishes, spoon etc. Formaldehyde is used in the manufacturing of phenolic resins, artificial silk and cellulose esters, dyes, organic chemicals, glass mirrors, explosives; disinfectant for dwellings, ship, storage houses, utensils, clothes etc., as a germicide & fungicide for plants & vegetables, improving fastness of dyes on fabrics, tanning & preserving hides, water proofing of fabrics, preserving & coagulating rubber latex, and as embalming fluids. Formaldehyde is used in the manufacture of explosives, photographic materials, antiseptic and fumigants, in treatment of pulp & papers, in cosmetics, fertilizers & fuels, in treatment of fur & hair, mouth wash, germicidal soap, lavender water & cologne, in sterilization of surgical instruments and as food preservative.